Jayson was watching the football game, Ember was sleeping and Ty well Ty was just being Ty. . . Everyone was doing their own thing so I thought I would cross one of my pinterest projects off my list. I love Sew much Ado. She made the most adorable felt flash cards...Hers are pretty fancy, my version is pretty basic but believe me Ty still loves them. I didn't want to buy anything for this project. I wanted to use things I already had in my craft boxes. 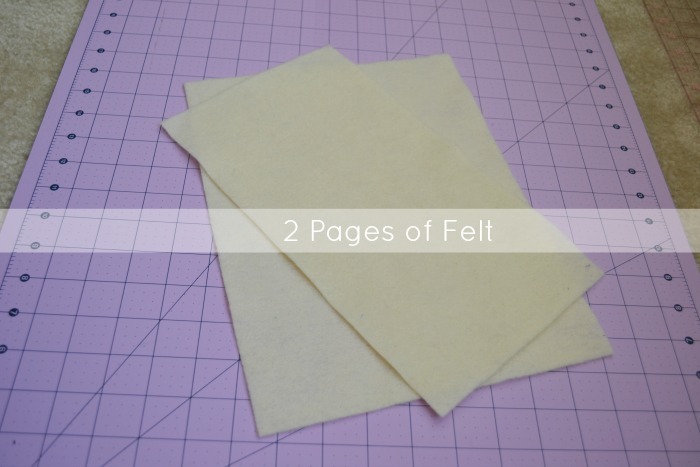 I had two felt pages the same color so they became the base of the flash cards. 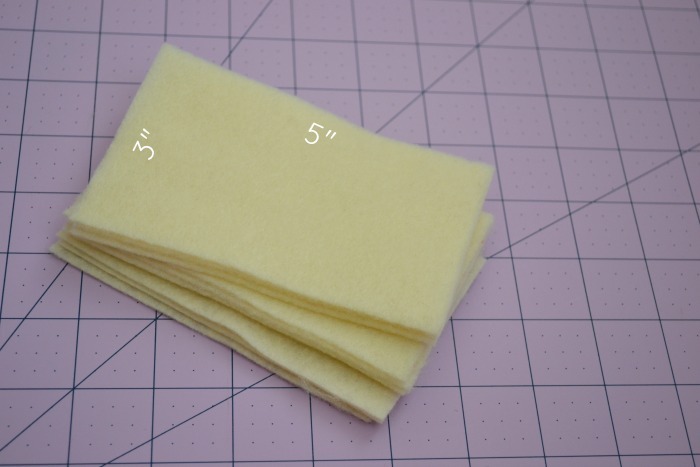 I cut them 3x5 with a rotary cutter and mat. Pulled out some scraps for the numbers and shapes. 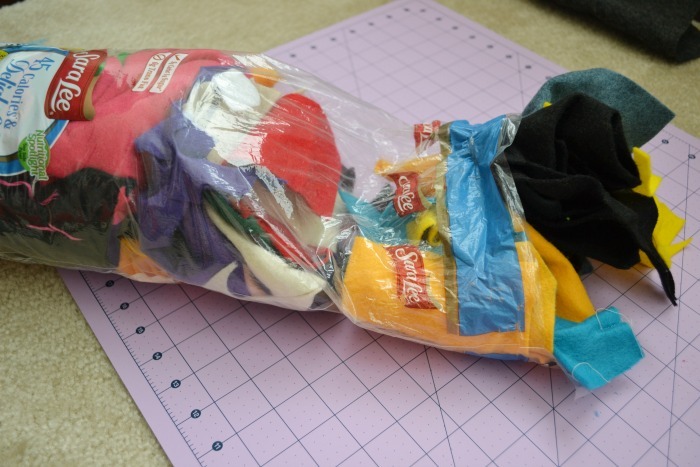 Yes, I totally keep my scrap felt in bread bags...Works great! Thanks mom for the good tip! Found some colors I liked and pulled them out. I traced out the numbers with a disappearing ink pen. That way I didn't have to print out a pattern. 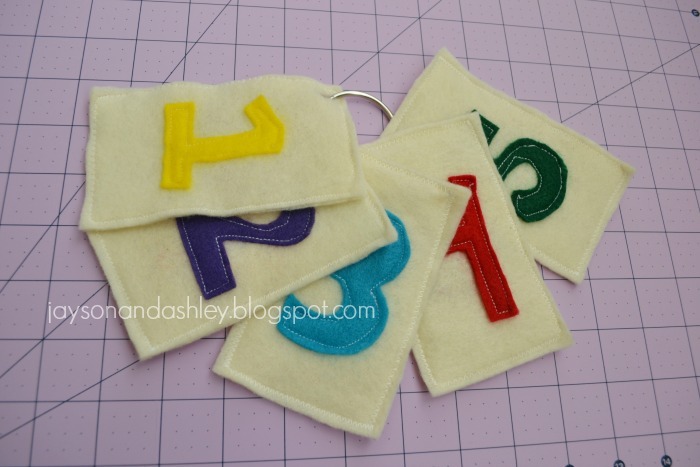 They are not even close to perfect, but I think Ty will still learn his numbers with them! The ink also goes away with in a few hours. 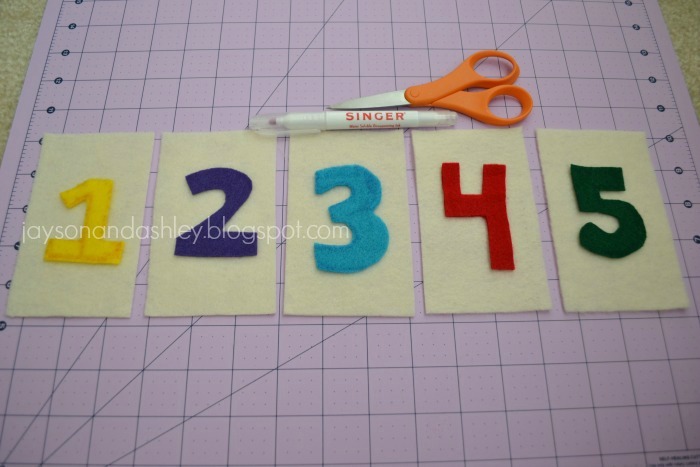 I sewed the numbers on with white thread. See how you can't see the ink on the 1 anymore! 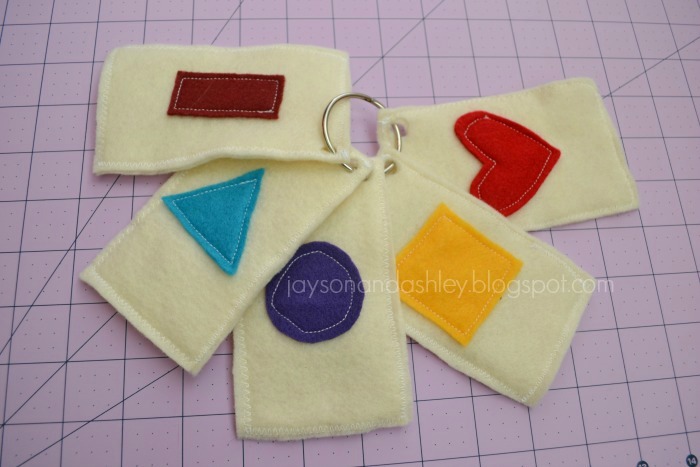 I also sewed on shapes. I put the numbers on top of the shapes and hole punched them. I used a regular paper hole punch and punched through the felt. It worked fine but had to do one layer at a time. Then I pinned them together and sewed around the edges. 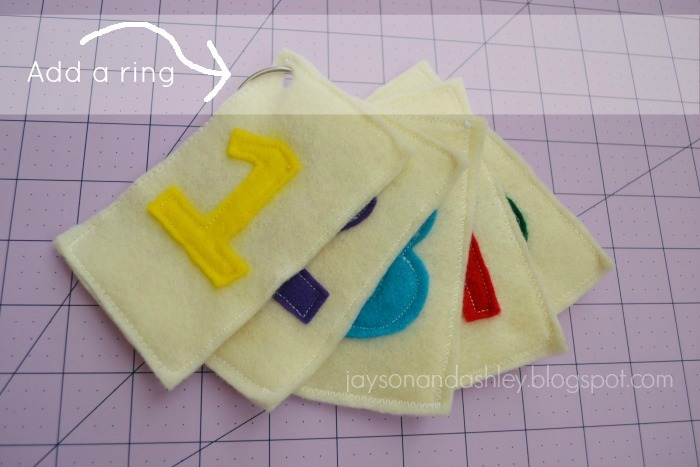 Put a ring through the holes and it makes a cute little flashcard book! I wanted to make more. 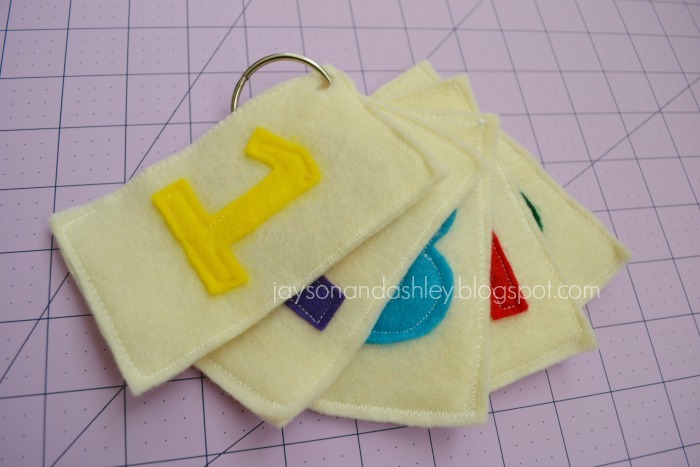 I think a second set would be fun so he can also use them as matching cards but I ran out of the cream felt. Maybe I will have to go to JoAnns shopping (dang it!! Lol). As for right now at least we can work on our numbers, shapes and colors. 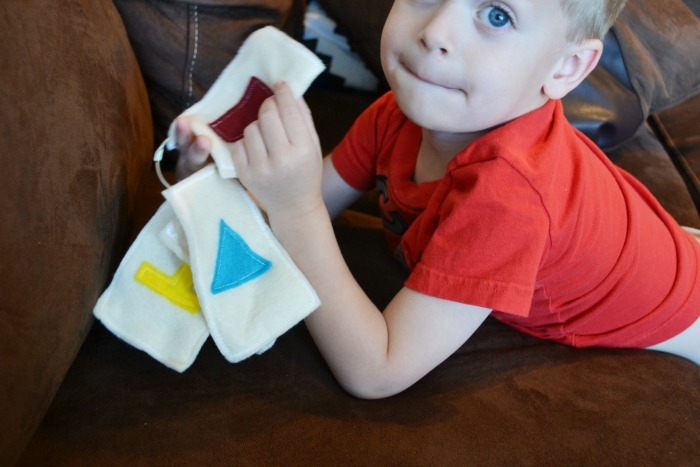 One of the very best parts about making you kids things rather than buying them all is when they say "Mommy made it!" So sweet! Even if you don't have all the supplies on hand this project would still be really cheap to make. Also if your making them for little hands like I am you don't have to worry about your flashcards ripping... My kids are little and pretty rough on things...Paper doesn't last long in this house. We have been doing really good at "Home-PreK." I had the good idea from a friend who also has a husband in Pharmacy school. She has a daughter who is just older than Ty and when her husband has to study or do homework...(Something Jayson does a lot of) they also have homework or study time. So now in the morning we all eat breakfast together and get ready. Then when daddy is off to school we start school. We do about a half hour (as much as Ty can take) of learning. Then we try to have singing time, snack time and then back to learning time. He thinks its pretty cool when I tell him daddy is at school learning too....even though I am pretty sure Jayson isn't having singing time. Ember isn't really learning her numbers, shapes or colors....but she does like to flip through the pages... She is still learning though...just like looking at a book. 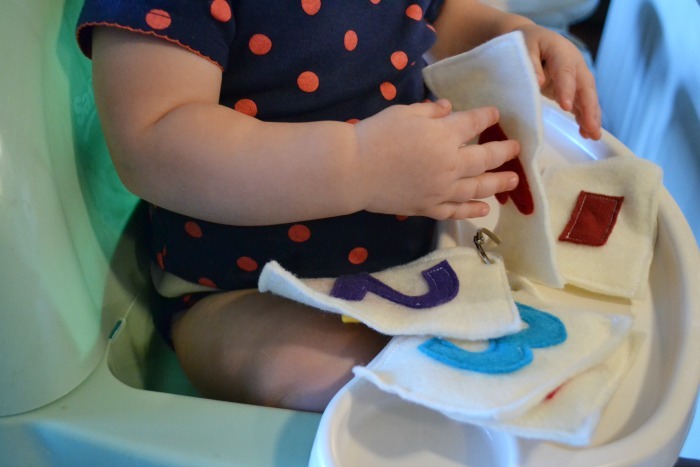 Seeing new shapes and colors is good for her little brain. It also keeps her entertained for awhile! What a wonderful idea! 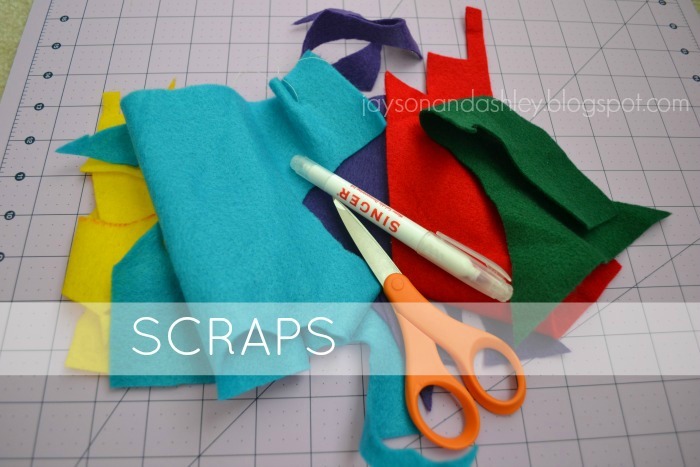 I have plenty of scraps as well! 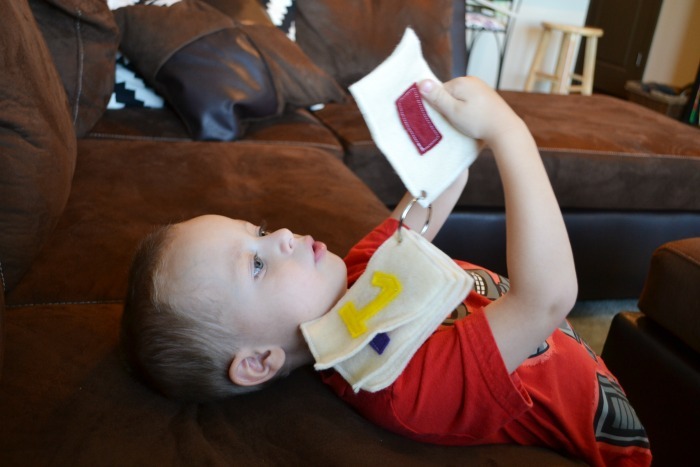 It will be a while before Eisley will need to use these, but even the stimulation is great! 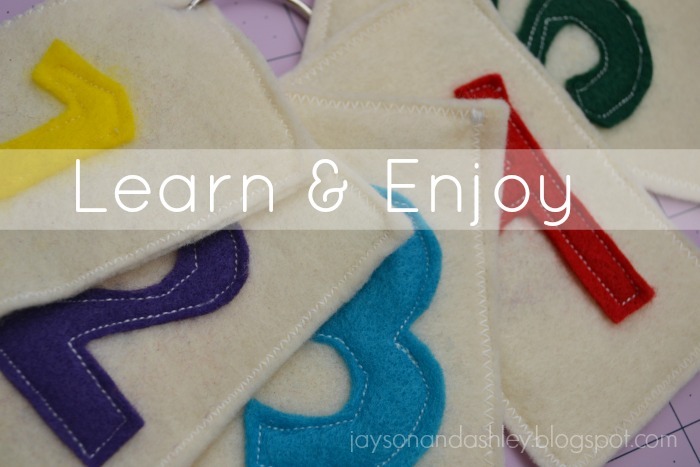 I love the idea of using felt instead of flashcards! Definitely pinning this for a future project!